From the Battle of Midway until the last German code was broken in January 1945, this is an astonishing epic of a war that was won not simply by brute strength but also by reading the enemy's intentions. CBI - China: Day 132 of 142 of the 1st Battle of Hebei. Japanese troops take control of all major gates and passes of the Great Wall in Hebei Province. UK: The coronation of King George VI takes place at Westminster Abbey in London. Spain: Day 300 of 985 of the Spanish Civil War. Spain: Day 665 of 985 of the Spanish Civil War. CBI - China: Day 310 of 2,987 of the 2nd Sino-Japanese War. Day 95 of 124 of the Battle of Henan. Day 3 of 3 of the Battle for Amoy Island in the Taiwan Strait. Japanese troops capture Amoy and the city of Xiamen. UK: Turkey and Great Britain make a security pact. CBI - China: Day 675 of 2,987 of the 2nd Sino-Japanese War. Day 23 of 35 of the Battle of Suizao. CBI - Mongolia: Day 2 of 129 of the Battle of Khalkhin Gol, a border dispute between the Soviet Union and Japan. ETO - UK: The United Kingdom begins the internment of German civilians. ETO - Norway: Day 34 of 63 of the Battle of Norway. ETO: Day 3 of 8 of the Battle of The Netherlands. German panzers reach the Moerdijk bridges 10 miles south of Rotterdam. After evaluating the situation, Dutch Crown Princess Juliana and Prince Bernhard flee to England. ETO - Belgium: Day 3 of 19 of the Battle of Belgium. The first tank battle in Europe takes place between the Germans and French. The French tanks overwhelm the Germans, destroying a large number of Panzers. ETO - France: Day 3 of 44 of the Battle of France. German panzers push out of the Ardennes and into France. CBI - China: Day 1,041 of 2,987 of the 2nd Sino-Japanese War. Day 180 of 381 of the Battle of South Guangxi. Day 12 of 49 of the Battle of Yichang. ETO - UK: Day 249 of 258 of the Blitz. Westminster Abbey, the Law Courts and a chamber of the House of Commons are damaged or destroyed. But tonight the skies will be quiet. ETO - UK: German spy Karel Richter parachutes into Hertfordshire on a mission to see if a fellow spy is a double agent. He will be caught in two days and will be executed on 10 Dec 41. MTO - Greece: British sub HMS RORQUAL sinks two small Greek vessels carrying German troops off the island of Lemnos in the Aegean Sea. MTO - Libya: Day 33 of 256 of the Siege of Tobruk. The Luftwaffe sinks the British gunboat HMS LADYBIRD at Tobruk. Italian torpedo boats sink the British sub HMS UNDAUNTED near Tripoli. Middle East: Day 11 of 30 of the Anglo-Iraqi War in Iraq. East Africa: Day 337 of 537 of Italy's East African campaign in the lands south of Egypt. CBI - China: Day 1,406 of 2,987 of the 2nd Sino-Japanese War. Day 6 of 21 of the Battle of South Shanxi. USA: Naval leaders in Washington DC disagree with Joseph Rochefort's conclusion that the Japanese are planning an attack on Midway. Atlantic: Day 119 of 169 of Germany's Second "Happy Time," during which U-boats sink 609 Allied ships with little risk. U-507 sinks the US tanker VIRGINIA just off the Mississippi River Delta in the Gulf of Mexico. Russian Front - North: Day 247 of 872 of the Siege of Leningrad. Russian Front - North: Day 94 of 102 of the Battle of the Demyansk Pocket, another failed attempt to break the siege at Leningrad. Russian Front - North: Day 8 of 658 of the Siege of the Kholm Pocket. Russian Front - Center: 2,500 residents of Ivye, Russia (Belarus) are massacred by the Germans. Russian Front - South: Day 1 of 17 of the 2nd Battle of Kharkov, Ukraine. The Soviets launch an offensive in effort to retake the city. Russian Front - South: Day 195 of 248 of the Siege of Sevastopol, Crimean Peninsula. German troops surround the defenders at Ak-Monay. Russian Front - South: Day 5 of 12 of the Battle of the Kerch Peninsula, Crimea. East Africa: Day 8 of 186 of the Battle of Madagascar. CBI - Burma: Day 150 of 164 of Japan's Invasion of Burma. The monsoon season begins, slowing the Allied retreat into India, but it also stops all Japanese attempts to attack the retreating columns from the air. CBI - China: Day 1,771 of 2,987 of the 2nd Sino-Japanese War. PTO - Japan: The USS POLLACK sinks a Japanese patrol vessel with her surface weapons off the coast of Japan. PTO - Malaya: Day 83 of 357 of the Battle of Timor Island. PTO - Philippines: The last US troops holding out surrender on Mindanao Island. ETO - UK: Decrypts of German transmissions confirm the success of the deception of Operation MINCEMEAT. Thousands of German troops and tanks are being sent to prepare for an Allied invasion of Greece instead of Sicily. It was widely believed that the next objective for the Allies after Tunisia was going to be the island of Sicily. 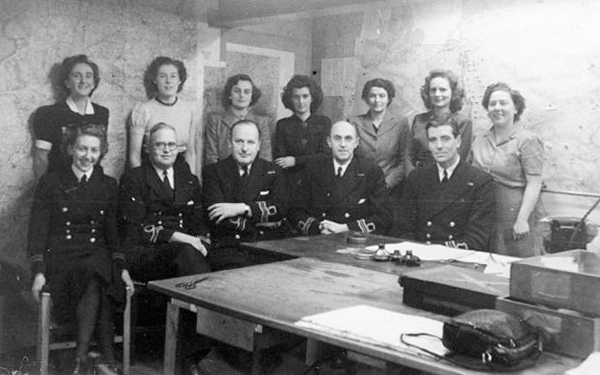 Persuading them otherwise was the objective for Operation MINCEMEAT. Winston Churchill would later say that "anyone but a bloody fool would know it was Sicily." But after the documents had been read by the Germans, General Alfred Jodl, head of the German supreme command operations staff said, "You can forget about Sicily. We know it's in Greece." The Germans swallowed the deception completely. On May 12, 1943, Adolf Hitler sent out an order, "Measures regarding Sardinia and the Peloponnese take precedence over everything else." He dispatched a Panzer division to Greece from France, ordered two further Panzer divisions in Russia to prepare to move to Greece (just before the great tank battle at Kursk), and moved an extra Waffen SS brigade into the area. He thought he was well-prepared for the anticipated Allied landing. Two days after the D-Day landings, the Germans discovered an abandoned landing craft washed up on the Vire estuary in Normandy, containing top secret documents detailing future military targets in the region. Hitler, believing this was a deception similar to Operation MINCEMEAT, ignored the documents, having already been convinced by numerous deceptions that the main invasion was still to come through the Pas de Calais. During Operation MARKET GARDEN, the drive into the Netherlands in September 1944, a complete operations order with maps and graphics for the airborne phase of the invasion, which was not supposed to be brought with the invading troops, was inadvertently left behind on a transport glider. The operations order fell into German hands, but the Germans, convinced that this was another attempt at Mincemeat-style deception, actually deployed their forces contrary to the information before them. ETO - UK: Polish Jewish leader Samuel Zygelbojm commits suicide in London as an expression of solidarity with the Jewish resistance fighters in Warsaw. Russian Front - North: Day 612 of 872 of the Siege of Leningrad. Russian Front - North: Day 373 of 658 of the Siege of the Kholm Pocket. MTO - Tunisia: Day 177 of 178 of the Battle of Tunisia. Come nightfall, all organized German resistance in North Africa ends as the top German commander and 25 other generals are captured. RAF and US Air Forces provide air support. MTO - Italy: US 12th Air Force RAF Wellingtons night bomb the docks at Marsala. CBI - China: Day 2,136 of 2,987 of the 2nd Sino-Japanese War. Day 1 of 23 of the Battle of West Hubei. PTO - Alaska: Day 340 of 435 of the Battle of Kiska, Aleutian Islands. Day 2 of 20 of the Battle of Attu. US 11th Air Force provides air support. PTO - New Guinea: Day 21 of 148 of the 2nd Battle of Lae-Salamaua. US 5th and 13th Air Forces provide air support. 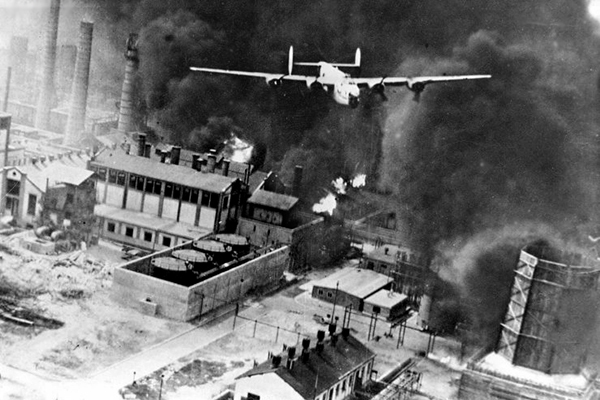 ETO: US 8th Air Force: B-17s and B-24s bomb oil production facilities in Germany and Czechoslovakia. Many top German leaders, including Goering, Speer and even Hitler himself, realize that this is the beginning of the end for the Third Reich, that the war now simply cannot be won. British General Arthur "Bomber" Harris insisted that the best way to defeat Germany was to bomb them into submission by destroying their cities and thus their will to fight. US General Carl Spaatz argued that to do so would only strengthen their resolve, just as the Blitz had merely strengthened British resolve. Spaatz had been pressing Bomber Command for some time that bombing the Germans out of gas would be the swiftest, surest way to destroy their ability to wage war. He cited the impact that bombing raids on Romanian oil fields in August of 1943 had made, yet Bomber Command paid him little attention. The planned D-Day invasion of Normandy had just been postponed from May 19th to June 5th, so bombing targets for this day were scrubbed. With no other missions in mind, it was decided to give in to Spaatz' incessant urging and hit the oil fields and gauge the impact, which was quickly noticeable. An ongoing campaign to destroy German refineries, synthetic production sites and fuel delivery systems then kicked into high gear. Although no one tactic or branch of Allied military service can claim to have been the deciding factor in winning the war (all were important), this campaign was clearly a heavy hitter. ETO: US 9th Air Force: IX Troop Carrier Command carries out Operation EAGLE, a full-scale dress rehearsal for the airborne invasion of Normandy. 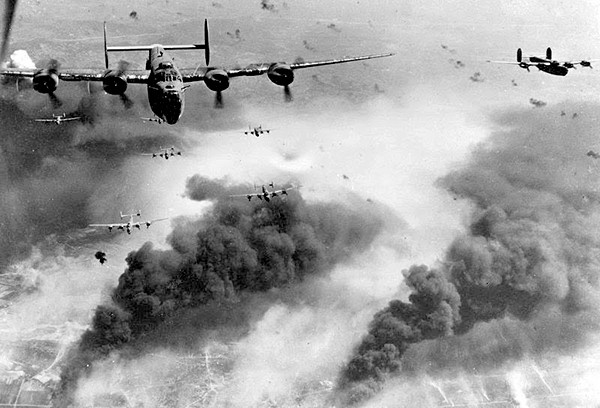 B-26s attack coastal targets in France and Belgium. Germany: 39 German Sinti children, 20 boys and 19 girls, arrive at Auschwitz Concentration Camp and are separated from their parents as a part of Eva Justin's dissertation "The fate of Gypsy children and their offspring raised in alien environments." Russian Front - North: Day 101 of 191 of the Battle of the Narva Isthmus, Estonia. Both German and Soviet troops remain in their defensive positions. Russian Front - South: Day 35 of 35 of the Battle of the Crimea. 36,000 men of the German 17th Army surrender. Russian Front - South: Day 35 of 60 of the Battle of Romania, 1st Jassy Offensive. MTO - Italy: Pressured by the respective governments, German authorities in Italy release Jews of Turkish, Spanish, Portuguese, Swiss, Swedish and Finnish citizenship. MTO - Italy: Day 117 of 123 of the Battle of Monte Cassino. RAF and US Air Forces provide air support. Day 2 of 8 of Operation DIADEM. The Germans make fierce counter-attacks as the Allies push hard. Victoria Cross: Kamal Ram of Indian 8th Punjab Regiment single-handedly takes out two German defensive positions and assists against a third near the Gari River. Then he charges at a house held by the Germans, capturing two and killing one. MTO - Italy: Day 112 of 136 of the Battle of Anzio. RAF and US Air Forces provide air support. CBI - Burma: Day 69 of 166 of the UK's Operation THURSDAY. CBI - Burma: Day 64 of 147 of the Battle of Myitkyina. US 10th Air Force provides air support. CBI - Burma: Day 42 of 302 of the Chinese Salween Offensive. CBI - China: Day 2,502 of 2,987 of the 2nd Sino-Japanese War. Day 26 of 259 of Japan's Operation ICHI-GO. Day 26 of 39 of the Battle of Central Henan, the first offensive in Japan's Operation ICHI-GO. Chinese troops are getting pushed out of central China. CBI - India: Day 66 of 118 of the Battle of Imphal-Kohima. The Japanese attacks southeast of Imphal are broken off. Anglo-Indian troops counter-attack at Tengnoupal, regaining the territory lost a week ago. PTO - Alaska: US 11th Air Force bombs installations on Matsuwa Island in the Kurile Islands, concentrating on the airfield on Tagan Cape. PTO - Marshall Islands: The US 7th Air Force bombs targets in the Jaluit Atoll. PTO - New Guinea: Day 74 of 80 of the Battle of the Admiralty Islands. 5th Air Force provides air support. PTO - New Guinea: Day 150 of 597 of the Battle of New Britain. US 13th Air Force provides air support. PTO - New Guinea: Day 21 of 481 of the Battle of Western New Guinea. PTO - Solomon Islands: Day 194 of 295 of the Battle of the Bougainville Islands. US 13th Air Force provides air support. ETO - UK: British troops land at St Hélier in Jersey, Channel Islands, and receive an overwhelming welcome. ETO - Czechoslovakia: US General Patton launches Operation COWBOY in Hostau rescuing 1,200 horses, including 375 of the Lipizzan breed, from potential Soviet slaughter. Russian Front: General Andrey Vlasov, commander of the anti-Bolshevist Russian Liberation Army, is turned over to the Soviets after being captured by the Americans. He will be executed for treason in August, 1946. MTO - Greece: The German troops on Crete finally surrender. CBI - Burma: Day 98 of 99 of the Battle of Pakokku and Irrawaddy River operations in central Burma. CBI - China: Day 2,867 of 2,987 of the 2nd Sino-Japanese War. Day 42 of 91 of the Battle of Zhijiang. US 14th Air Force provides air support. Day 34 of 60 of the Battle of West Hunan (near Zhijiang). Japanese troops continue withdrawing from southern China. PTO - Caroline Islands: US 7th Air Force bombs at Marcus Island and Param Island in the Truk Atoll. PTO - Dutch East Indies: Day 12 of 52 of the Battle of Tarakan Island. Victoria Cross: Australian Corporal John Mackey is killed while destroying three machine gun nests at Tarakan that had been holding up his comrades. PTO - Japan: Day 42 of 83 of the Battle of Okinawa. US Army troops land on Torishima, Ryukyu Islands. Japanese kamikazes damage the USS NEW MEXICO off Okinawa. Meanwhile, 125 Japanese planes are shot down. PTO - New Guinea: Day 502 of 597 of the Battle of New Britain. US 10th Air Force provides air support. PTO - New Guinea: Day 386 of 481 of the Battle of Western New Guinea. US 10th Air Force provides air support. PTO - Philippines: Day 205 of 299 of the 2nd Battle of the Philippines, aka the Liberation of the Philippines or the Philippines Campaign. PTO - Philippines: Day 149 of 244 of the Battle of Luzon. 5th Air Force provides air support. PTO - Philippines: Day 64 of 159 of the Battle of Mindanao Island. 5th Air Force provides air support. PTO - Philippines: Day 56 of 135 of the Battle of the Visayas region. US 5th and 7th Air Forces provide air support. Germany: After eleven months, the blockade of West Berlin by the Soviets is finally lifted. Two German states will soon be formally created. Go well beyond the famous raid of August 1, 1943 and examine the entire 1944 strategic campaign that all but knocked Ploesti out of the war and denied the German war machine the fuel it so desperately needed. An illustrated account of the careers of two fighter Aces of the Luftwaffe's night fighter force, both killed in action.